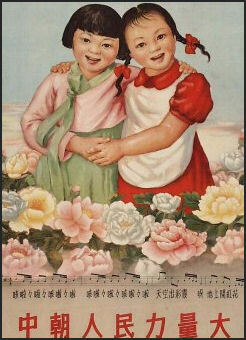 Korean-war-era friends poster China is North Korea’s foremost ally. The two countries share a 1,415-km (880-mile) border. John Delury, a scholar of China and the two Koreas at Yonsei University in Seoul, told the New York Times: “Chinese diplomats are the only ones who can pick up the phone and talk to North Korean counterparts about what is going on, what to expect. China sees North Korea as a strategic barrier against the United States and its regional allies. According to the New York Times, China wants North Korea to stand strong as a buffer state that keeps American troops in South Korea at a distance But that barrier comes with an economic and diplomatic price. China's trade and aid are crucial to Pyongyang's survival, but bring only puny economic gains to Beijing. China helps North Korea to remain viable and keep going through economic assistance. China worried that the collapse of the current regime in the neighboring nation would seriously affect its own stability. The Bill Emmott, a columnist with the Times of London, wrote, “China wants the North as it is: a buffer against Japan and a way to avert a future troublesome unified Korea.” He regards North Korea as “the likeliest flashpoint for a potential conflict between China and the United States.” One possible scenario for such a conflict would be a bloody power struggle after Kim Jong Il dies that would force the United States to invade North Korea to secure its nuclear weapons, with such a move being interpreted by Beijing as provocation, forcing it to also send troops into North Korea. China is the only foreign country other than Russia that Kim Jong Il has visited while leader of North Korea. In May 2010, Kim Jong Il paid a rare visit to China, traveling to Beijing in search of additional economic assistance. In return, he agreed to return to six-party talks. , hosted by China, though no date was set. In February 2010, it was revealed that China planned to help North Korea with more than $10 billion in investments and aid. This came at time when the international community was pressuring North Korea with sanctions because of it nuclear weapons policy. Chinese diplomats on a number of occasions have encouraged North Korea to return to the so-called six party talks on nuclear disarmament. Classified U.S. cables released through Wikileaks November 2010 show China’s frustration with North Korea---with a former deputy Foreign Minister He Yafei quoted by a U.S. official in April 2009 calling Pyongyang a “spoiled child” over staging missile test to win concessions from the United States---and reveal speculation by U.S. diplomats that China could be open to the idea of a Korean peninsula unified under South Korea . China has blocked reports on North Korea’s nuclear activities from being released to the entire United Nations. China put pressure on North Korea to return to the six-nation talks during “an official goodwill visit” by Chinese Premier Wen Jiabao to North Korea in October 2009. ''Premier Wen explained to President Lee that China invited Chairman Kim Jong Il to provide the North with an opportunity to understand China's economic development and use the understanding for its own (economic) development,'' Yonhap quoted Hong Sang Pyo, Lee's spokesman, as telling reporters. Wen was quoted as telling Lee that Beijing opposes a nuclear-armed North Korea and would work to create an environment for inter-Korean dialogue. As on his previous trips to China, Kim was shown such facilities as automobile and electronics factories as well as plants manufacturing equipment to produce solar energy, indicating China continues to hope Kim turns to reform. When asked why China invited Kim, Chinese Premier Wen Jiabao told South Korean officials the trip would the Kim “the opportunity...to understand China's development and utilize it [the knowledge] for North Korea's development." In October 2006, North Korea held its first nuclear test explosion, defying public pleas from China, and nuclear disarmament negotiations hosted by Beijing have languished for years without fresh progress or even fresh talks. Those incidents might have increased anxieties in China about North Korea, but they have also made North Korea more dependent on China for economic support. Two scholars of North Korea at the Peterson Institute for International Economics, Stephan Haggard and Marcus Noland, estimated in a paper published this year that China and South Korea alone recently accounted for 55 percent to 80 percent of North Korea’s trade. After the Cheonan sinking, most trade with South Korea stopped, so China became an even bigger partner. Frantic Efforts to Efforts to Adopt Chinese Models in North Korea Before Kim Jong Il’s Death? In the 18 months before his death, Kim Jong Il, who previously rarely travelled abroad, visited China four times. During Kim's visit in May 2011 China and North Korea sides vowed that their alliance, "sealed in blood", would pass on to their successors. Far more promising is the development at Rason, on the far northeastern edge of the Korean peninsula, where China has brought in an old Korea hand named Tian Baozhu, a Kim Il Sung University graduate and former Consul-General in Pusan, to set conditions for further Chinese investment in this highly-desired port which finally offers eastern Jilin and Heilongjiang provinces access to the sea and cheaper means of shipping coal to ports like Shanghai. Rason remains a source of rumors from South Korea and the active advocates of immediate North Korean collapse, who often imply that China is not simply constructing the port but has secured it with a few thousand PLA troops. Such impressions are unlikely to slow the CCP in its push for more access and faster development of Chinese business interests, particularly in the minerals sector, in North Korea. Chinese cultural exchanges with North Korea have been, in the DPRK context, incredibly extensive. The oft-maligned Korean Central News Agency has opened up exchanges with Xinhua, performing arts delegations tour across the Chinese mainland, and a Confucius Institute is open in Pyongyang with some 800 students. Tourism to the DPRK, another area of possible peril’seven Chinese tourists and businessmen were killed in a mysterious crash outside of Pyongyang on Thanksgiving Day---is an area where the Chinese side puts a great deal of stock and aims to develop further from even remote cities like Qiqihar and Mudanjiang. The extent to which the North Korean side remains committed to the speed and intensity of these relationships is something which the Chinese government is particularly keen to observe. Chinese leaders here had been hoping Mr. Kim would live for at least another two or three years to solidify the succession process that he had begun with his youngest son, Kim Jong-un, the former officials and analysts say. Uncertainty now looms over whether the younger Kim can consolidate his power in the face of competing elite factions and whether he and other leaders will continue initiatives begun by his father, including studying China as a model for possible economic reforms, the observers say. The elder Kim had made four trips to China in the last 18 months to look at a range of economic projects and Chinese leaders had urged him to experiment with reforms. The greatest concern for China is whether Mr. Kim’s death will lead to a rise in tensions on the divided Korean peninsula. That scenario could unfold if generals in Pyongyang, the capital of North Korea, try to reinforce their hold on power through aggression toward South Korea. Unlike China, where the Communist Party stands as the ultimate authority, the military is the final arbiter in North Korea. There were some irreverent takes. Netease, a popular Internet portal, ran a topics page with a headline saying: “Kim Jong-il’s Death Shows the Importance of Losing Weight.” The subtitle was even more subversive: “A government is just like a human body, in that neither can afford to be too fat.” As of Monday evening, the page was still online. Protecting stability on China's 1,415-km (880-mile) frontier with the North and throughout the region will be paramount. "This has really come out of the blue. It's not like it had been rumoured for a while giving everyone time to properly prepare," said Cai Jian, an expert on Korean affairs at Fudan University in Shanghai. "China's biggest worry will be over North Korea's stability, and China's aim will be to ensure the country remains stable," said Cai. "I think security will be stepped up in North Korea, and China is also likely to tighten security along the border." "The Kim Jong-il era is over, and the post-Kim Jong-il era has begun, and this era will certainly bring change to the Korean peninsula. That's without any doubt," said Zhu Feng, a professor of international relations at Peking University who specialises in East Asian security issues. "The issue of primary concern now is not whether North Korea will maintain political stability, but what will be the nature of the new political leadership, and what policies will it pursue at home and abroad," said Zhu. "In the short-term, there won't be new policies, only a stressing of policy stability and continuity. So soon after Kim Jong-il has died, no leader will dare say that an alternative policy course is needed." "I think it's ultimately good news," Zhang Liangui, an expert on North Korea at the Central Party School in Beijing, said of Kim's death. "I think it's good news, because North Korea will finally have to change. Whether those changes will be for the better or the worse, we'll have to wait and see. But there's no doubt that change is needed and inevitable." Even Kim Jong Un’s foreign experience was highlighted in Chinese media as beneficial. It seemed that in some important ways, Kim Jong Un could be used to send home the message to China’s unreceptive youth: It may be fine to spend a few years studying abroad and fall in love with Michael Jordan, but when you come home, it’s all about the Young Pioneers and Party building. More importantly, the junior Kim’s probable role in North Korean attacks on the South Korean vessel “Cheonan” in March 2010 and on Yeonpyeong Island in November 2010 was downplayed in the PRC. South Korean stories which asserted that Kim Jong Un had assumed control over North Korea’s northern border security, like most narratives focused on refugees, did not enter the public discourse in China. The CCP’s evident nervousness about stability in North Korea, and its protective stance toward the DPRK, means that no loud public doubts about Kim Jong Un’s inexperience are presently welcome. Suggestions that the successor is incapable of leading, when allowed at all, are placed in the mouths of foreign experts like the International Crisis Group’s Daniel Pinkston, and qualified with some implication that South Korean media reports could all be false anyway. North Korea appears to have made only a minor rhetorical concession to Chinese pressure by referring to the idea of “uniting around the Korean Workers’ Party and Comrade Kim Jong Un,” a phrase codified in the DPRK’s official response to the Chinese Foreign Ministry’s initial statement of regret at Kim Jong Il’s death. Economic and Cultural Exchanges The legacy of Kim Jong Il’s rapid---one might almost say rushed---advancement of cooperation with China in 2010 and 2011 hangs in the balance, and the CCP will be eager for cross-border trade and tourism to resume. A rather explicit December 20 editorial in the Huanqiu Shibao, entitled “China is the Reliable Friend Upon Which North Korea Can Rely during Transition,” stated: “We suggest that as soon as it is appropriate, Chinese high-level leaders go to North Korea, where they will intimately communicate with North Korea’s new leaders at this special time that Pyongyang can send a distinct signal to the world [by taking the Chinese path].” Border security on the northern frontier remains a complex and sensitive issue, as well as military-to-military relations. The fact that eight North Korean border guards were reputed to have run headlong into the Liaoning hills in late November is not to be forgotten; the fact that China was hosting the Japanese Self-Defense Forces Navy in Qingdao (of all places) from December 19-23 is another area which under normal conditions might cause strain on Sino-North Korean relations. The trade can take many forms. Susan Shirk, a former State Department official and professor of political science at the University of California at San Diego, told the New York Times she spoke with a North Korean man in Pyongyang in September 2011 who was conducting state-to-state trade with China. She said the North Korean worked for the Ministry of Foreign Trade, and he was selling iron ore to China at the price that China pays to large trade partners like Australia; in return, he was buying corn from China at the price on the Chicago Mercantile Exchange that day. North Korean leaders are also trying to jump-start the languishing trade zone of Rason on the Chinese border and to get Chinese businesspeople to invest in tourism infrastructure that includes a creaking cruise ship running between Rason and the Mount Kumgang nature park. There have been similar reports of shootings in the past, but they are not normally confirmed by either of the two governments. Smuggling is commonplace across the highly porous border and, according to residents, is a source of bribes to security personnel on both sides. South Korea's Yonhap news agency said the dead men were well known smugglers in their hometown Dandong on the North Korean border and had made prior arrangement as usual with their North Korean partners. After a decent interval, North Korea will probably pursue economic changes that will present opportunities and worries to Beijing, said several Chinese experts, Reuters reported. "In economic policy, I think there will be major changes now that Kim Jong-il has passed away, and also in economic opening up there'll also be significant steps," Wei Zhijiang, director of the Korea studies institute at Zhongshan University in south China, told Reuters. "The generation of Kim Jong-un have a strong awareness that North Korea can't remain isolated from the world." Beijing will hope the younger Kim will embrace more measured economic reforms that will ease the chronic shortages enduring by North Koreans. But any wider opening by the North to South Korea and its allies could dilute Chinese economic and political influence, something that fuels strategic worries in Beijing. And China could also worry that any changes could spiral beyond the grip of Pyongyang's leaders and their Chinese mentors. In the past 18 months, Kim, who previously rarely travelled abroad, visited China four times. During Kim's visit in May the two sides vowed that their alliance, "sealed in blood", would pass on to their successors. Do Hee-Yun, head of the Seoul-based Citizens' Coalition for Human Rights of Abductees and North Korean Refugees, said the refugees left North Korea in three separate groups and were arrested in different places in China. "They were returned to the North clandestinely over the past two weeks," Do told AFP. "They are likely to be severely punished as they fled the North during the mourning period." Rumors are common near the border that the new leader issued a shoot-to-kill order against people attempting to cross the border during the mourning period and also called for stern punishment for their relatives, Do said. North Korea has in the past treated its citizens who crossed the border to find food with relative leniency while punishing severely anyone who attempted to flee to the South, according to the dissident group North Korea Intellectuals Solidarity. More recently, all refugees are now treated as traitors worthy of severe retribution, the group of North Korean defectors based in Seoul said. Seoul has repeatedly urged Beijing to treat people fleeing North Korea as refugees and not to repatriate them. China says the group sent back in recent days consists of economic migrants and not refugees deserving protection. The UN refugee agency had also urged Beijing not to send back the North Koreans. Rights watchdog Amnesty International says returnees are sent to labor camps where they are subject to torture. More than 21,700 North Koreans have fled to the South since the 1950-1953 war, the vast majority in recent years. They typically escape on foot to China, hide out and then travel to a third country to seek resettlement in the South. Beijing alienated South Korea by failing to criticize North Korea's shelling of a South Korean island of Yeonpyeong. Beijing response to the North Korean attack was relatively tepid. It failed to condemn North Korea and said both North and South Korea need “to do more to contribute to peace and stability on the peninsula...We express our concern over the situation.” But the Chinese press praised North Korea’s “toughness” and criticized South Korea’s for the “failure of the hard-line policies.” Favorable views of China in South Korea fell from 66 percent in 2002 to 38 percent in 2010. In December 2010, two fishermen were killed and three were detained after a 63-ton Chinese trawler capsized and sank after ramming a 3000-ton South Korean Coast Guard patrol vessel. The trawler was illegally fishing on China’s Exclusive Economic Zone. The three fishermen attacked the South Korea coast guard officers with iron pipes and shovel but were ultimately freed after protests from the Chinese government. A South Korean officer stabbed in the side was taken by helicopter to a hospital in the port city of Incheon but later died, Kim said. The other officer was stabbed in the abdomen and was to undergo surgery. The Chinese captain had minor injuries from the fight and was also taken to the hospital, Kim said. The weapon was not identified. Besides the captain, eight other Chinese fishermen on the boat were arrested and taken to Incheon, the coast guard said in a statement. Ahn Sung-sik, a South Korean coast guard investigator, told reporters that the captain denies using violence. Sergeant Lee Cheong-ho, 41, the victim of the incident, was the second Coast Guard member to be killed while on patrol for Chinese intruders in three years. More than 20 maritime police personnel were wounded during this period. Chinese fishing fleets have been going farther afield to feed growing domestic demand for seafood. The South Korean coast guard says it had seized over 470 Chinese ships for illegal fishing in the Yellow Sea in 2011, up from 370 last year. The coast guard usually releases the ships after a fine is paid, though violence occasionally occurs. The 2011 stabbing was the first deadly clash between the South Korean coast guard and Chinese fishermen in three years. In 2008, one South Korean coast guard officer was killed and six others injured in a fight with Chinese fishermen in South Korean waters. Last year, a collision between a Chinese fishing boat and Japanese coast guard vessels led to a diplomatic spat between the countries over disputed islands in the East China Sea. Starting in 2009, China's fishing fleet has also appeared to be acting in concert with the nation's perceived intention to press forward with claims in disputed maritime areas---2009 was the deadline imposed by a U.N. treaty for continental seabed contestants to file formal undertakings---and by a sense that the financial crisis in the West had opened the door to more assertive Chinese behavior in areas it had long regarded as falling within its legitimate sphere of influence. In March of that year, several Chinese fishing trawlers accompanied by two Chinese fisheries enforcement ships and at least one Chinese naval vessel harassed an American surveillance ship 75 miles (120 kilometers) south of China's Hainan island. The JoongAng Ilbo daily newspaper called the fishermen "pirates" in a front-page headline, and the Chosun Ilbo newspaper said in an editorial that the coast guard should have more ships at its disposal and be more forceful in the fight against heavily armed fishermen. President Lee told a Cabinet meeting that South Korea will get tough on illegal Chinese fishermen, according to the presidential Blue House office. Many South Korean felt Chinese authorities failed to adequately apologize for the 2011 fatal incident. Chinese Foreign Ministry spokesman Liu Weimin expressed regret for the officer's death, though he glossed over Seoul's accusations that the captain fatally stabbed the South Korean officer.Asked at a daily media briefing whether China would compensate the dead officer's family, Liu said the Chinese government is working with South Korea "to investigate and verify the situation." He said China is ready "to settle relevant issues." Monday's deadly incident has touched off predictably angry sentiments among some Chinese, who accused South Korean authorities of bullying behavior. Hundreds of coastguard officers and tearful family members attended the victim's funeral in the western port of Incheon. "We will come up with fundamental measures so that a tragedy like this will never take place again," President Lee Myung-Bak said in a speech delivered by an aide. The officer's three children sobbed as they held a photo of him. Officials say the Chinese captain accused of stabbing him will face a murder charge in the South while eight crew members are accused of obstruction. Amid growing diplomatic strains, South Korea's embassy in Beijing was hit by an apparent airgun shot, prompting Chinese police to launch an investigation, according to Seoul's foreign ministry and media reports. No one was hurt. A window was broken Tuesday apparently by a metal ball found nearby, a ministry spokesman said. Yonhap news agency said it appeared to have been fired from an airgun. Text Sources: New York Times, Washington Post, Los Angeles Times, Times of London, The Guardian, National Geographic, The New Yorker, Time, Newsweek, Reuters, AP, Lonely Planet Guides, Compton’s Encyclopedia and various books and other publications.